So I think I’ve finished migrating my blog to the new server. It’s on Ubuntu 16.04 now, instead of 12, and running on PHP7 instead of PHP5, and on mariadb instead of mysql, and on Nginx instead of Apache. Lots of little problems came up. For one thing, the old database was configured so that the character set was latin1 instead of utf8. But wordpress was putting utf8 bytes into it. Which worked fine until I went to migrate the data. Because now-a-days mysqldump delivers data in utf8 encoding by default, so in order to get the bytes out unmolested, I had to specify to dump as latin1. Then, it’s necessary to edit the dumped .sql file and change the latin1 in there to utf8. Quite a headscratcher. If you see accented characters showing up as TWO weird characters, this is probably what happened to you. Next, a shout out to Lets Encrypt which is providing the SSL certificates for my domains. Configuration was incredibly easy. I’m still running on Linode, which is working reliably — as it has done for the past many years! They no longer let me create an instance of the size I used to use, so my new instance is slightly smaller… when all is said and done I might save a little money! I’m also trying an experiment where I track changes to my Linux configuration in `/etc` using GIT. Unfortunately, lots of files change in `/etc` for reasons that aren’t meaningful configuration changes… so it will probably be of dubious value. FeelieFaces… that you can wear! Are you looking for some adorable, fun, and fashionable apparel? 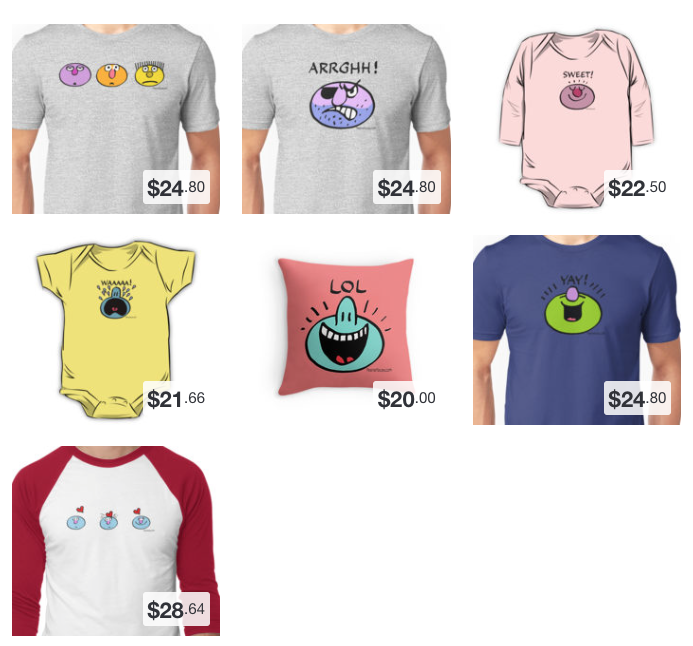 How about a FeelieFaces T-Shirt from Redbubble? Cruise on over to the FeelieFaces Redbubble Shop. This is a continuation of my previous post. When we left off, I was trying to figure out which pins on the Sparkfun SevSeg display I could repurpose for my own purposes as digital out pins. I did some research on the ATMega chip, and it is pretty clear that most of the pins on the top row of the SevSeg could be used for other purposes. Having identified which (Arduino) pins were connected to the display, I was able to figure out which pins were connected to the top row of solder points by using a simple programs that displayed a number on the LCD while simultaneously toggling that pins state to high and low. I had some trial and error — for example my multimeter takes about 4 seconds to register a change in voltage and my initial script was changing the voltages faster than that… at first it seemed like nothing was happening! But finally I figured out the pin numbers for the solder points. Only after I did all that did I look in the header file provided by the Sparkfun “board” for the SevSeg and see that they’d provided convenient macros for those points! All in all I found 6 available digital I/O pins. I decided to connect five pins to the Easy Driver — Enable, Step, Dir, MS1 and MS2. I left MS3 disconnected. This will allow me to control the direction of rotation, turn off power to the motor, and use half, quarter and one-eight stepping modes for slow speeds. That left one pin for a button. I verified that I could make inputs work by simply connecting one output pin to one input pin by sliding a resistor between the two solder points. When I programmatically set one of them to output HIGH while putting the other into INPUT_PULLUP, I verified that I could read a state change. Next I soldered connections between the buttons and the EasyDriver and the SevSeg. I’m also using the EasyDriver as a power supply for the SevSeg. I found some example code for how to drive the stepper motor by sending alternating HIGH and LOW pulses to the STEP pin, each with some delay. This worked perfectly, on the first try. However, when I tried adding the digital display to show how many rotations are left, I ran into a problem. The SevSeg.cpp uses delays internally to rapidly illuminate each digit in succession. I also needed carefully timed delays between each STEP I send to the stepper. Arduino doesn’t have any threading support. I was facing having to build some kind of scheduler to allow these two tasks to do small bits of work offset by time delays. Ugh. But then I discovered the clever pt.h “threads” library by Adam Dunkels. This imposes some pretty strict limitations on your “C” code — e.g. locals are not persistent across WAITs. But the solution to that was the (normally frowned upon) practice of using static/globals for everything! The original SevSeg library was built around a C++ object, which I had to refactor to be a static “C” function — easily done once I made all its member fields public (another no-no, normally!). The end result: I can control both the motor and the display simultaneously without one (significantly) interfering with the other. Today I opened my new Sparkfun 7-Segment display and tried my hand at using it as a general purpose Arduino controller. My ultimate plan is to use it to drive a stepper motor and to respond to the input of a push button. However, this item interested me because it has 4 7-segment LED displays attached to it, which means my project could provide some minimum visual feedback. 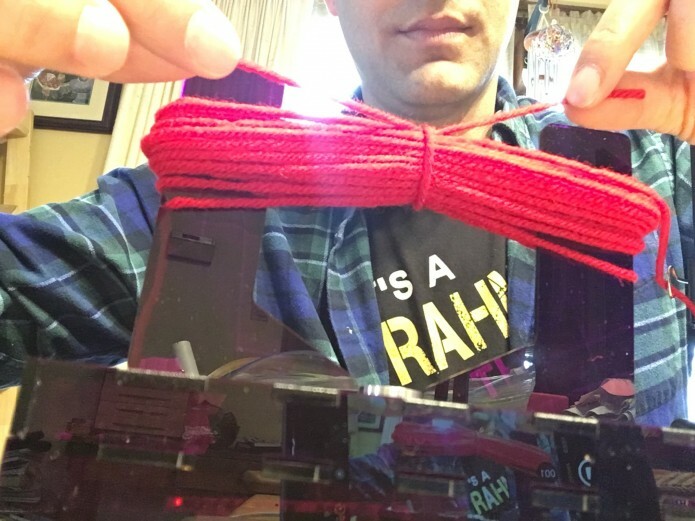 First, I opened the package and soldered 6 header pins onto the end — put them inside where the package is silk screened with a little white line. I plugged in a FTDI connector and plugged that into my Mac. It displayed a zero on the first of the LED displays. Next I installed the Arduino IDE and the FTDI driver for my Mac. The instructions for FTDI driver installer said to run a command `sudo kextunload –b com.apple.driver.AppleUSBFTDI` but that just gave me an error message (“Can’t create –b. Can’t create com.apple.driver.AppleUSBFTDI.”) so I don’t know if it did anything. Next I tried running some sample SevSeg.cpp files but had trouble. I realized I needed to program this device using a definition provided by Sparkfun. I followed the instructions in this repo’s readme file to install those definitions: https://github.com/sparkfun/Arduino_Boards and then selected “Sparkfun Serial 7-Segment Display” from the Arduino IDE Tools -> Board menu. Instead I installed Xvnc by typing `sudo apt-get install vnc4server` then I created a password file called vncpassword.file like this: `vncpasswd vncpassword.file`. Finally I started the VNC server with `Xvnc -PasswordFile vncpassword.file` and let that run. Then in a second ssh connection to my server I enabled X by typing `export DISPLAY=:0.0`. Then I started CrashPlanDesktop with `/usr/local/bin/CrashPlanDesktop`. Now on my Mac I connected to my server by going to the Finder, choosing Command-K (The “Goto” menu) and entering “vnc://my.server.name” (My server has a DNS entry — you could also use the IP address). Then I saw the CrashPlan UI over VNC. That’s also where I noticed that it was having trouble updating to the latest version. I found a log dir in `/usr/local/crashplan/log` and one of the recent files had this message: `This client requires one of these JREs: 1.7 1.8. Exiting upgrade`. I was able to install Java 7 using `sudo apt-get install openjdk-7-jre` and then `sudo update-alternatives –config java`. Finally, restart the CrashPlan back-end with `sudo /usr/local/crashplan/bin/CrashPlanEngine restart` I haven’t (yet) uninstalled Java 6. Do you have an iPhone or iPad? Try my new Box Game. It’s inspired by “Uncle Lester”, a magician from the early twentieth century who had a passion for puzzle boxes. My version has a few levels (4 or 5) and no instructions. It’s designed to entertain you for a few minutes and that’s all. Leave comments here if you have feedback. If you like it: that makes me happy. If it gives you trouble or you don’t like it… well, at least it was free. No matter how tired you are of putting on your long johns and your flannel lined jeans and your down vest and your insulated snow pants and your wool scarf and hand-knit hat and thinsulate gloves and micro-fiber parka and felt-liner muck lucks … Put them on. It’s cold outside. I was surprised to see that Xcode does not make it easy to build all the various icon files for AppIcons for Mac OS and IOS. A few tools have been whipped together, but I’m not a fan of needing to install a whole new GUI app just to solve a simple problem. I’m also not a huge proponent of python, but it’s one of the scripting languages that natively supports JSON — which is part of how Apple’s implemented .xcassets (look inside you’ll see a file called Contents.json). So here is my solution — you’ll need to customize it for your own project. This particular project has two different AppIcon.appiconset entries in the xcassets file. Note that this script re-writes the Contents.json file, to normalize the file naming. By default if you drag-and-drop files into Xcode it just adds -1 and -2 etc.. to the name, which is lame. Whenever you update the icon (hardcoded here as a file called ‘icon.pdf’) re-run this script and the icon for you Mac and/or iOS app will update! I’ve read that you’re supposed to be able to use git rebase to move commits from an old repo to a one after using git filter-branch. But I couldn’t get that to work. The backstory: Our repo was bloated because we started by forking a different project, and then deleted unneeded parts. This was an easy way to get started, but we ended up with all the history of the old project. So I ran git filter-branch and some other tools to clean up the history and remove empty merge commits. While I was preparing that, the rest of the team kept working on the old repo.